i am very very happy for you, stephanie. you and danny both deserve this and the world doesn't always give us what we deserve. modern horror has always been reflective of our times. in the 1950s it was about foreign things attacking us (THE DAY THE EARTH STOOD STILL, THE BLOB, INVASION OF THE BODY SNATCHERS). in the 1970s it was a representation of the right maintaining order... the smokers, tokers and sexually active die not doing what their told and the virginal "final girl" (which is an actual film term) is left to survive. FRIDAY THE 13TH, HALLOWEEN, NIGHTMARE ON ELM STREET. the idea being if women did what they were told to do (ie, be good girls), they'll survive the threat but not actually kill it. that being said, enjoy your trip. come back safe. three is a magic number. 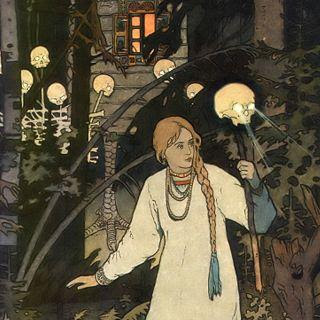 I actually took a class on Fairy Tales in undergrad and the Russian ones were just a tad scarier. Have a wonderful trip - I've followed your blog since I saw your comments on the Russian adoption group a few months ago. We first went to Russia to bring our 8 month old son home in 1997 ! It was the most exciting MAGICAL event of my life... savor every minute ! Hooray Stephanie - so thrilled for you both! The fairy tales may not be the best stuff - but I gotta tell you there is amazing depth of thought and insight in Crime & Punishment. One of the better books on crime. Also it will put the kid to sleep for years until he gets it. Bonus! Congrats! Please, please, remember to inform everyone who wants to come to your lovely theme parties for your son. Steph, I am so excited and happy for you, Danny, and your little boy--and not just because he's going to marry my daughter, either. You are all in my thoughts as the time passes s-l-o-w-l-y.